Arkansas allows students to earn dual credit in academic and/or CTE courses through endorsed concurrent enrollment offered at their high school. Dual enrollment is available for college credit only. Students who have completed eighth grade also can earn dual credit through enrollment in a publicly supported community college or four-year institution of higher education. Students who have completed eighth grade may take developmental/remedial coursework for dual credit. Public postsecondary institutions are required to accept these credits within certain guidelines (Education Commission of the States, 2015). Arkansas is not participating in the Early College High School Initiative (ECHSI). More information about schools participating in ECHSI is available at the ECHSI website (Jobs for the Future, n.d.). Arkansas implements programs of study across all 16 Career Clusters. 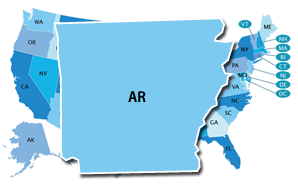 Arkansas does not have a statewide system for career exploration or career plans at the K–12 level. Arkansas’ state-specific Early Warning System is called the Arkansas studentGPS Dashboards. The level at which Early Warning System data are reported is not publicly available. District officials, principals, and teachers can access Early Warning System data, although formal documentation of this access has not been identified.